Last February 21st, at the Royal Yacht Squadron of Cowes, Isle of Wight, has been held the signing of “A Life in Shipping” by Esben Poulsson, member of Cambiaso Risso Advisory Board. If ever an industry is global, it is shipping and Esben Poulsson’s career is a perfect example of that fact. He was born in Denmark, came of age and entered the maritime world in Vancouver, moved to Hong Kong as a shipbroker, spent two years in the Philippines, relocated to London and Copenhagen, and then moved back to the East, this time to Singapore where he has worked and resided since 2004. He is variously Chairman and a director on company boards in Singapore, Hong Kong, Copenhagen and Genoa. He heads international organisations based in Singapore and the UK. He is, in a few words, a citizen of the world. Knowledge and contacts are everything in the maritime industry: starting as a Sale & Purchase shipbroker, Poulsson not only learned a great deal about ships and the products they transport, but also about shipowners, ports, government tax regimes and regulations on shipping’s responsibility for the environment. In his senior roles, he has witnessed and learnt from different types of management and understands the need for group decisions and diplomacy. He has met a lot of people, some of whom have become firm friends, most of whom are well recognised in the industry and some heads of state. He has chaired or been a key note speaker at high-level conferences in pretty well every maritime centre in the world and travels an enormous amount. The maritime industry is a community in which people are asked to contribute to the common good by giving of their time freely to international and local institutions. Poulsson has taken his place in several such organisations, the most recent including President of the Singapore Shipping Association and Chairman of the International Chamber of Shipping. For light relief in such a busy life, Poulsson turned to yachting, a sport in which he was initiated at an early age in Vancouver and in which he has participated in various international competitions – some of which his team won – all his life. Readers of this book will find that a maritime career is varied and exciting, full of challenge. It offers – with hard work, an entrepreneurial mind and excellent networking skills – great possibilities for friendship and for travel. 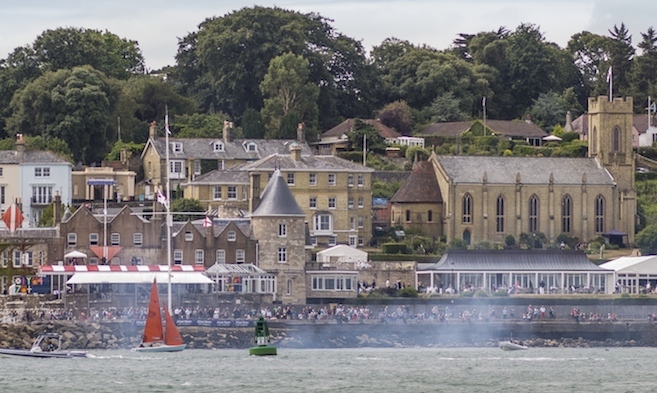 The Royal Yacht Squadron is one of the most prestigious and exclusive yacht clubs in the world, and enjoys a rich history after more than 200 years. Founded on 1 June 1815 in the Thatched House Tavern in St James’s, London as The Yacht Club by 42 gentlemen interested in sea yachting, the original members decided to meet in London and in Cowes twice a year, to discuss yachting over dinner. Membership was restricted to those who owned a vessel not under 10 tons. Today this is interpreted as a gentleman “actively interested in yachting”.